This trip starts at Owen Springs which 50 km from Alice Springs and has plenty of variety to keep you interested with creek crossings, a couple of soft sand sections with the track following creek and river beds through a gorge, bush and waterhole campsites, and short detours to points of historic and scenic interest. A short section south on the Stuart Highway leads to the Rainbow Valley turnoff. (14 km further south is Stuart Well roadhouse if you need fuel etc, or a hot shower.) The next 24 km generally has extremely bad corrugations. Keep an eye out just before entering the reserve for a track on the left which will be taken on leaving next morning. Rainbow Valley campsite only has 7 sites with fireplaces and a long drop toilet so arriving early is a good idea. 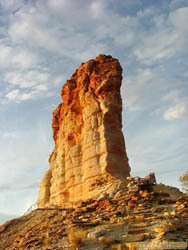 There is a short walk across the claypan to Mushroom Rock, which can be extended to a couple of hours if you do the circumnavigation. The sunset over the rock can be viewed from your campsite or there is a viewing platform nearby. Next morning exit the reserve and take the right turn noted the day before. Navigation is tricky so follow the Gps track plot. (This short cut saves about 80 km compared to backtracking to the Stuart Highway and is far more interesting). The track turns and heads east past some cattle yards etc. Turn right and head south just before the Central Australian Railway. (The better track over the rail line is banned as it is the railway service road.) This heads south through some interesting country before running next to the rail line. A left turn is made onto the Hugh River Stock Route which immediately crosses the rail line and heads east. From here navigation is easy to Maryvale where fuel and supplies are available. The run in to Chambers Pillar is very corrugated and there are great distant views of the pillar at the top of the steep track section. There are a few soft sand dunes just before the reserve so take care as the road is narrow. The campsite is similar to Rainbow with everything nearby. There are short walks to the Pillar and the Castle and a walk at sunset is necessary to get the best photos. This trip ends here. Backtrack to Rodinga and head north back to Alice Springs. Alternatively turn right and head south to Mt Dare and the Simpson Desert, along the Old Ghan Railway which is also the route of the Finke Desert Race.